SKU: LL-U7-. Categories: Exterior Finishes, Perma-Chink. After multiple exposure tests in harsh weather areas across the country Lifeline Ultra-7 stands out as the top-of-the-line, long-lasting exterior finish. Lifeline Ultra-7 provides your home with appearance, longevity and value in an all-in -one exterior wood finish. Beautiful, rich wood tone tints with satin or gloss top coats highlight the beauty of your home while protecting it from damaging UV rays. Please Note: Lifeline Ultra-7 requires one coat of Lifeline Advance Topcoat. Log Wash or Wood ReNew maybe used to remove mold or mildew. However, Wood ReNew is NOT a maintenance cleaner and should not be used to remove mold or mildew on surfaces which already have Ultra 7. Do not apply Lifeline Ultra-7 to wood over 18% moisture content. Applying Lifeline Ultra-7 to wood with moisture content of over 18% can result in peeling, blistering and severely reduced product durability. To test the moisture content of your wood, borrow a moisture meter from your contractor or purchase one at your local hardware store. Laminated logs: The moisture content of laminated logs is generally below 14%. These logs are usually ready for immediate application of Lifeline Ultra-7 once they have been cleaned and allowed to dry for the appropriate amount of time. Always use a moisture meter to confirm the moisture content. 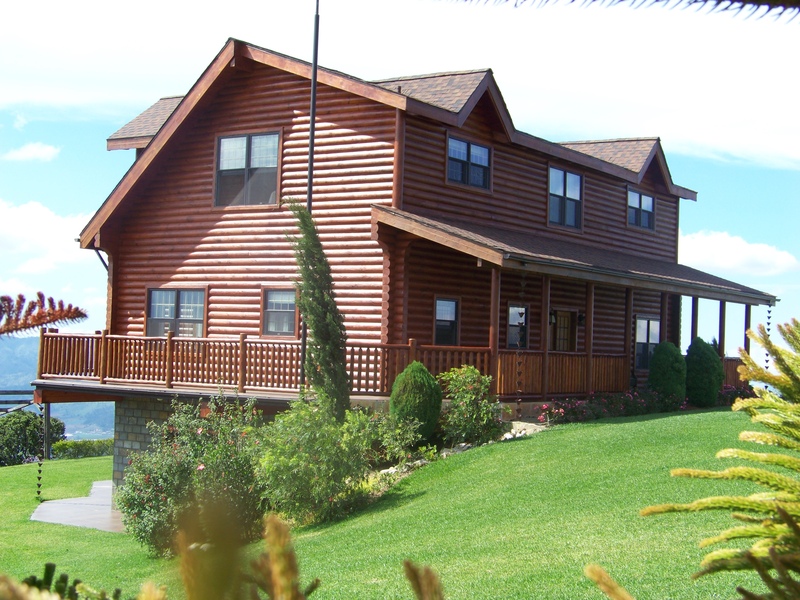 Green, wet, or treated logs: These logs have moisture content greater than 18%. Allow the logs to sit in a dry area and check their moisture content on a regular basis. Logs with high moisture content can take up to 6 months to 1 year to reach the appropriate 18% or below moisture content for applying Lifeline Ultra-7. Have your logs been pre-treated with a wood preservative ( borate ) at the factory or mill? Contact your log or siding provider if unsure. Wood preservatives ( borates ) make wood toxic to wood damaging organisms such as powder post beetles, carpenter ants and fungi. Wood preservatives do not protect against Carpenter Bees and other wood drilling insects; only those that ingest wood. Click here to find out about additives available for prevention of Carpenter Bees. 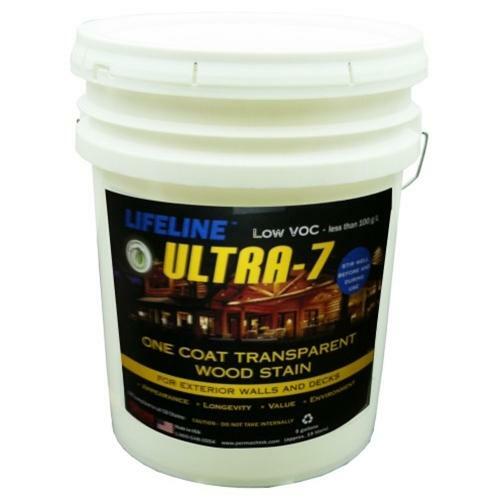 Why apply a wood preservative ( borate ) before applying Lifeline Ultra-7? 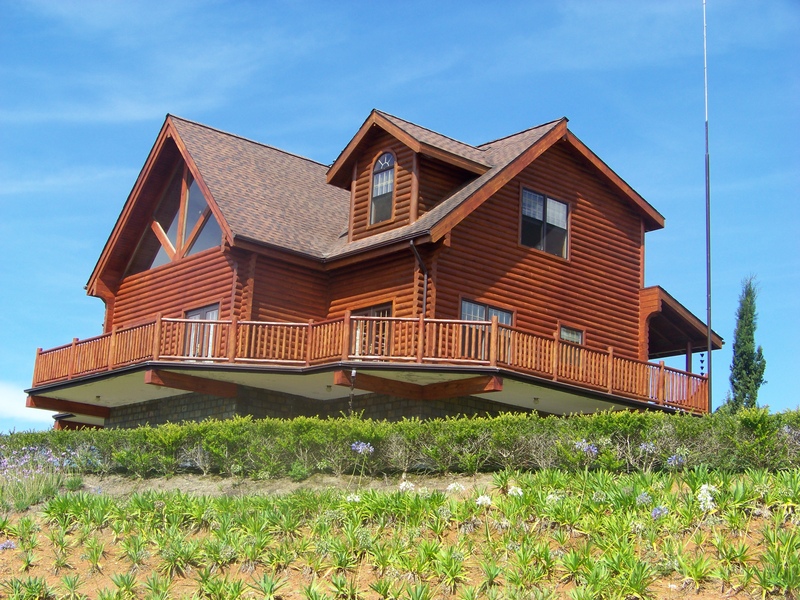 Applying a wood preservative can protect your home from damaging organisms for the life of the home. Lifeline Ultra-7 contains a mildewcide, water repellent and UV protection; it is not a wood preservative. LogFinish.com recommends applying ShellGuard RTU or ShellGuard Concentrate to your logs before applying Lifeline Ultra-7. ShellGuard RTU, ShellGuard Concentrate, and Lifeline Ultra-7 will not prevent Carpenter Bees from drilling, to treat for Carpenter Bees use Bug Juice Insecticide in Lifeline Advance Topcoat. Fill any spaces between the logs and upward facing cracks/checks in the wood after applying a wood preservative and before applying Lifeline Ultra-7. Fill all joints, cracks, and nail holes with a good quality acrylic latex caulk/filler created specifically for use with wood like Energy Seal or Check Mate 2 prior to applying finish. We always recommended performing a one coat color test to a clean, dry, bare area of the structure that you are planning on applying Lifeline Ultra-7. Please Note: Lifeline Ultra-7 is difficult to remove once it has been applied. 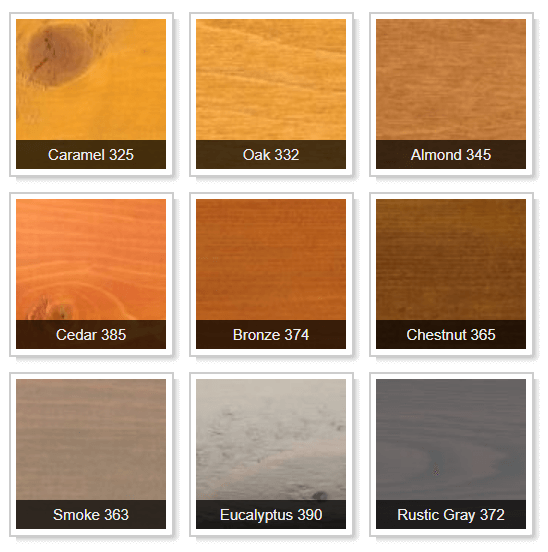 Before doing a full application make sure that your color selection is correct, has a look you want, and a maintenance schedule you can manage. Apply Lifeline Ultra-7 when temperatures are between 40° and 90° F.
Do not apply Lifeline™ Ultra-7 to surfaces that have been brushed or rubbed with steel wool (rust spots may appear under the finish). Log Wash is the only cleaner recommended for maintenance cleaning after Lifeline Ultra -7 has been applied. A yearly cleaning is important to prolong the life of your exterior finish and to maintain the best appearance. Periodic cleaning of exterior walls is important to prolong the life of your exterior finish system and to maintain the best appearance. Lifeline Advance clear coats help reflect sunlight, which reduces the amount of UV that gets through the semi-transparent coating to the wood surface. Keeping the surface free of dust and other contaminates maintains this reflective quality. Fill all checks with Backer Rod and Check Mate 2 . Lifeline Ultra-7 is shipped via FedEx ground and meets VOC compliance for all 50 states. Lifeline Ultra-7 ships same day when ordered by 1pm EST. Be the first to review “Lifeline Ultra-7 Exterior Finish” Click here to cancel reply.